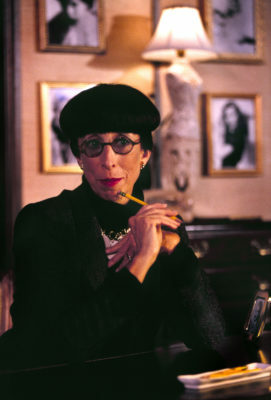 In her six decades of costume design, Edith Head worked on over eleven hundred films; dressed the greatest stars of Hollywood; received 35 Academy Award® nominations, and won an unprecedented eight Oscars®. Edith Head’s story is as fascinating as the history of the film industry itself, filled with humor, frustration and, above all, glamour. This diva of design helped to define glamour in the most glamorous place in the world – Hollywood! Susan Claassen was inspired to write and star in “A CONVERSATION WITH EDITH HEAD” while watching a TV biography of Ms. Head. Susan Claassen said: “Not only do I bear a striking resemblance to Edith, but we share the same love for clothes and fashion. Edith survived the boy’s club of Hollywood to enjoy a 60-year career, during which she worked on 1,131 films, earned 35 Oscar nominations and won eight. She stitched Dorothy Lamour into her sarong; put Bob Hope and Bing Crosby in kilts in “The Road to Bali”; created Bette Davis’ glamorous Margo Channing; made teenage girls swoon over Elizabeth Taylor’s white ball gown in “A Place in the Sun”; dressed Ingrid Bergman in “Notorious”, Grace Kelly in “To Catch A Thief”, Kim Novak in “Vertigo”, Gloria Swanson in “Sunset Boulevard” and Sean Connery in “The Man Who Would Be King”. There are many myths about her but she was a discreet, tenacious personality. She knew whose hips needed clever disguising and made sure those legendary stars always looked the part. Our show gives the inside scoop on Edith and the Golden Age of Hollywood.